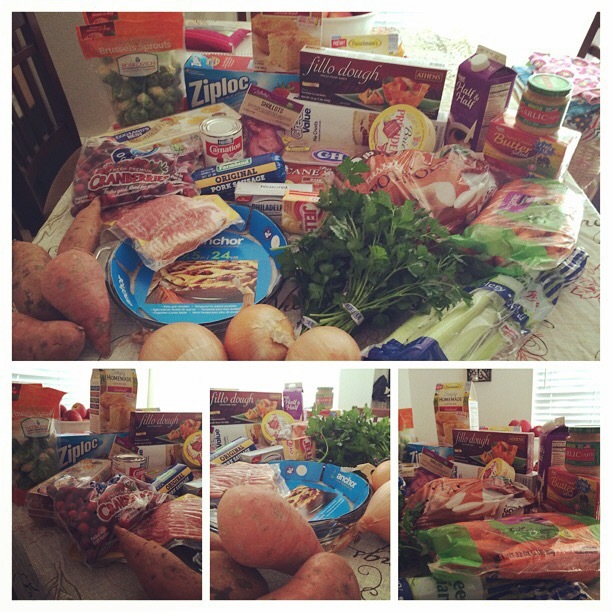 We’ve been trying to pinch pennies around here, and a great way to save money is to cut back on groceries. Instead of going grocery shopping this week, I am using up the groceries that I already have in my fridge, freezer and pantry and have created this fantastic Free One Week Meal Plan that includes Breakfast, Lunch and Dinner with Recipes and Grocery List! 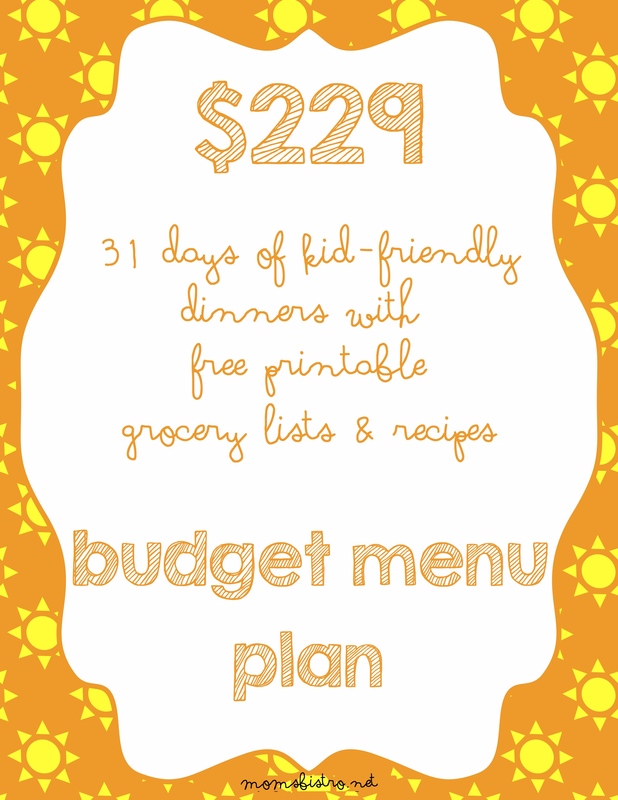 If you’ve been following Mom’s Bistro for a while, you’re probably familiar with my Monthly Meal Plans. 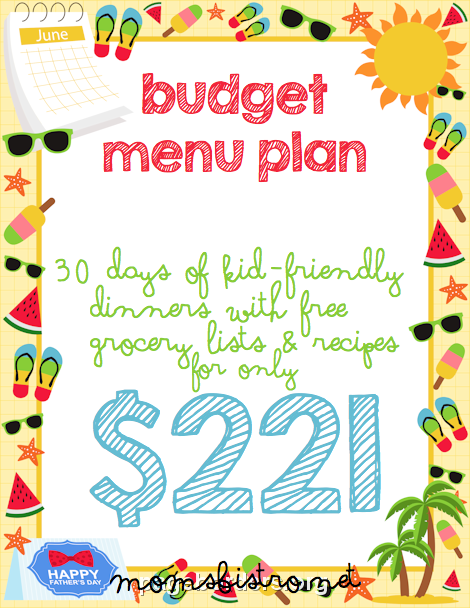 These meal plans are designed to feed a family of 4 without breaking the bank. Sold on Etsy, the Meal Plans are $5 and include 5 weeks of breakfasts, lunches and dinner menus with special seasonal recipes. 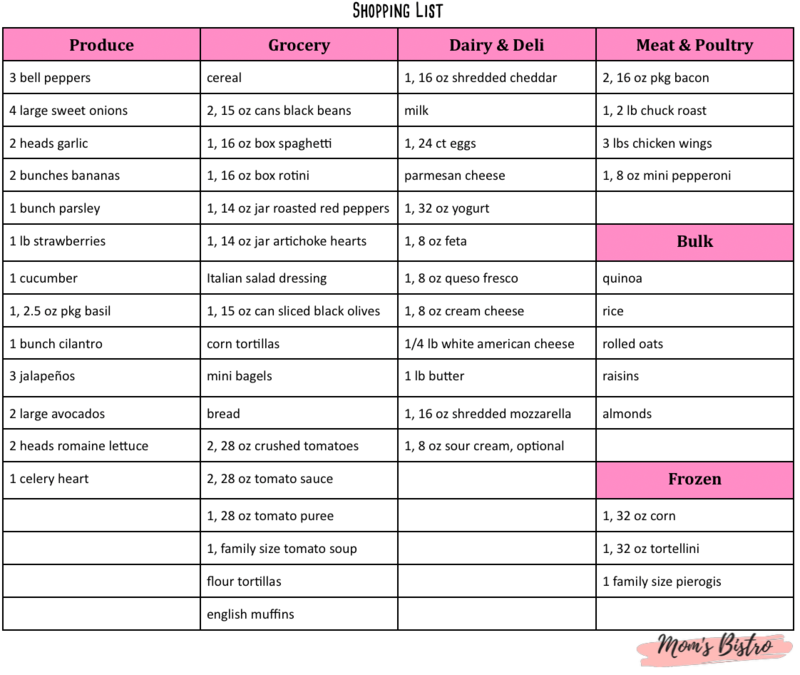 Each Meal Plan has 40+ recipes, a grocery list for shopping for ingredients in bulk, weekly grocery list breakdown with how-to tips and tricks to make dinnertime foolproof. This Free One Week Meal Plan will include an example of what you get in my Monthly Meal Plans with all of the recipes included as well! Plus, learn how I looked through my kitchen, and took inventory with the Kitchen Inventory Lists that I created and have included for you at the bottom of this post, and figured out just what the hell I had in my house. Turns out we had a lot of food in the house, and I really didn’t even need to go grocery shopping. You’re going to love these Inventory Lists. I included them as a bonus a few months back on a Meal Plan on Etsy, and they have been such a hit, and just so helpful to me in my own kitchen, I wanted to share them with all of my readers right away! Now just what the hell do I make with all of this food? Here is the menu that I came up with for my family for the next week. The * means that it is a new recipe for my blog – you may have seen it in an Etsy Menu in the past, but it is new to Mom’s Bistro. It’s a pretty tasty menu, isn’t it? I think so, and my boys are pretty excited for it too. Best part is, is that I don’t have to do any shopping at all for this week. I have every single ingredient for every single recipe already in my house. I love it when things work out like that for me! So what do you need to do to get planning for this week? Today doesn’t involve a lot of work for me because we’re going to Dave and Becky’s for breakfast, we’re going to finish up the leftovers from last week for lunch, and I am making Stuffed Peppers for dinner. Dinner only takes about half an hour to prepare and cook, so I’ll get ready for the week today while I prep my Stuffed Peppers. broccoli for Monday night’s dinner > cook this in the last 5 minutes with the pasta for the pasta salad, and then just drain it all and separate it in the colander. Slice up some bananas to serve over your favorite cereal for breakfast. For lunch, just simply heat up the burrito bowl that you made yesterday, and top with fresh tomatoes and shredded lettuce. Prep the Pasta Salad for tomorrow’s lunch tonight. Slice up strawberries and make a parfait with layers of granola, fruit and yogurt. Ingredients to make homemade honey-nut granola are included in grocery list. No Instant Pot? No problem. Using the same ingredients, cook the chuck roast in your slow cooker for 6 hours on low. I have included the following ingredients on the grocery list to top the tacos; cilantro, lime, avocado, queso fresco and corn tortillas. If you don’t have any leftover Spaghetti Sauce in your house, prepare some tonight in the base of your slow cooker so that in the morning all you have to do is put the base in the slow cooker and turn it on. – toss all ingredients together and let sit for at least 30 minutes before serving. We’re using leftover Spaghetti Sauce to make tonights dinner, but I have included the ingredients to make the spaghetti sauce in the grocery list just incase you didn’t have any. If you’re making fresh Spaghetti Sauce, prepare it on Tuesday night, so that all you have to do in the morning is drop the base in the slow cooker and head on out the door. To prepare Tortellini, cook tortellini according to package directions. Toss with warmed Spaghetti Sauce and serve with extra parmesan cheese. When preparing the salad to go with tonights dinner, cut up extra lettuce, cook extra bacon, and slice extra parmesan cheese. Mix it all together and transfer to a ziplock bag so that when it’s time to make lunch on Friday, you just need to toss the prepared salad mix with the salad dressing and some sliced and cooked chicken. It’s all about efficiency, baby! It’s all about heart-shaped things today. The day starts off with Heart Shaped Eggs In A Hole (get the recipe tomorrow), continues with a Valentine’s Day themed bento box for lunch and the day ends with tomato soup and heart shaped grilled cheese. For lunch, the bento box includes ingredients to make a heart shaped peanut butter and banana sandwich (make it a heart by cutting the bread with a heart shaped cookie cutter and then assembling), ants on a log with the raisins placed together to make a heart, and some of the leftover Chocolate Covered Strawberry Puppy Chow that I made last week. For dinner tonight, use the cookie cutter that you used this morning to cut out the heart for the eggs in a hole, and the sandwich, and cut out hearts to make grilled cheese. Take your canned tomato soup (which is included in the grocery list for tonights dinner) to the next level by adding 1 can of milk and 1 can of chicken or vegetable broth to the soup when making it. Cook up the chicken for tomorrows lunch tonight while you’re eating dinner. – combine all ingredients together in the base of an Instant Pot. Place lid on, and turn valve to sealing. Cook on manual high pressure for 5 minutes. Let steam naturally release for 5 minutes, quick release steam. Remove lid, stir and serve right away. Use up the leftover lettuce mix that you mixed up on Wednesday to make Chicken Caesar Salad Wraps for today’s lunch. Toss the romaine, sliced parmesan, bacon and the chicken that you cooked up last night with some salad dressing and wrap it up in a flour tortilla. For tonight’s dinner, BBQ sauce is considered a kitchen staple, and is not included in grocery list. If you don’t have BBQ sauce, add it to your list. Fry or grill chicken wings – recipe for grilled chicken wings included in grocery list, and toss them with your favorite wing sauce. Making homemade fries makes homemade chicken wings so much better, and my easy to make Oven Baked French Fries are crispy on the outside and light and fluffy on the inside – you’ll have no idea that they were even baked! If you want to add french fries to your menu, add 3 large russet potatoes to your grocery list. Make extra pancakes today when you make breakfast. Freeze leftover pancakes in a single layer on a baking sheet lined with parchment until completely frozen. Transfer them to a labeled ziplock bag. To reheat, place 2-3 pancakes on a microwave safe plate and cover with a damp paper towel. Microwave on high for 1 minute – 1 minute 15 seconds. For lunch, mini pepperonis are included in grocery list for topping English Muffin Pizzas. Add your favorite toppings to grocery list. For tonight’s dinner, add extra bacon to grocery list and cook bacon with pierogis as well. How To Prepare a Foolproof Thanksgiving Feast with Walmart Grocery To Go with Foolproof Make Ahead Recipes | PLUS: Get $15 Off Of Your First Walmart To Go Order!